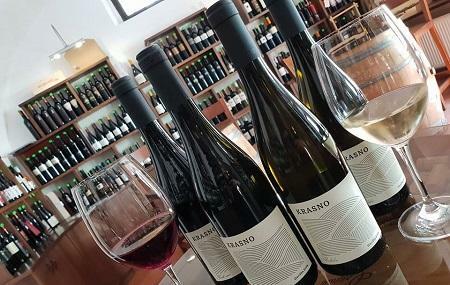 Is there anything better than Slovenian wine? Find it out yourself! Vinoteka Sodcek is a place that caters to literally every wine lover, given the variety and stock it has. The diverse selection of wine available here makes it a delight to stop for a while and enjoy a delicious tasting session. There is about five taste of Slovenian wines served along with cheese and olive in each of these sessions. From premium wine to exclusive and sparkling wine, and many other beverages like coffee, cold drinks, and whatnot, just name it and you will get it here. The lush surrounding and lovely views of the farmlands only add to the experience making it a memory for life. Ensure to buy a wine of your preference to take as a souvenir with you. 5 taste of Slovenian wine for 15 Euro. Wow! What a wonderful find in the lovely town of Radovljica. I wandered in and was able to taste five Slovenian wines and enjoy a delicious board of local cheeses, olive oil, and cured meats. The woman in the shop was extremely knowledgeable and friendly, and even gave me a free taste of two other wines to illustrate the flavor profile of some local varietals. Highly recommended! Excellent service with full explanations as to the origins and taste of the wines and food which was much appreciated. The wines, meats and cheeses are all as local as possible and quality is seriously good. To top it off the prices are such that the value is unbeatable. Definitely worth a visit, my advice would be to ask for a dinner spread and spend a few hours enjoying the different wines of Slovenia. 5 star experience. Great experience. We did the wine tasting which consisted of 5 different Slovenian wines, bread, local cheese, and local prosciutto. The food and wine were excellent and the staff was very friendly and accommodating. A table of town people even invited us over to drink and dine with them. Price is very reasonable and we even purchased another extra bottle of wine. Amazing wine bar with great atmosphere. I could drink and chat here all day long. Very friendly sommelier, who explains you perfectly the wine, chese. The right right place to be. We did the wine tasting and it was fantastic. They give you 5 wines, all from Slovenia and will change the selection based on your taste. The woman who served us was quite knowledgeable and friendly. You also get Slovenian prosciutto and a selection of local cheeses. There is also Slovenian olive oil, which tastes different than most others I've had. We took our time with the tasting and didn't feel rushed at all. Highly recommend.